Do you have a special someone graduating this year? If so, here are a couple projects that can help you get ready for the big celebration! The project includes a "Congrats" Banner and a Graduation Cap centerpiece. 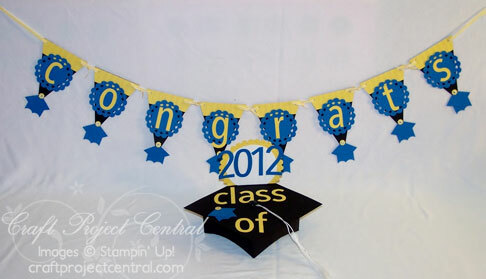 Customize the project to the specific school colors for a special project sure to make your grad feel special! This wonderful project was designed by Chrisy! If you have a moment please hop on over to Christy's blog and leave hear a comment on her project! If you would like to subscribe to the May edition of Craft Project Central and get 10 fabulous tutorials for just $10 then click HERE!